The MIZ-85iD leverages the architecture of our industry-leading MIZ-80iD eddy current instrument into a modular, instrument-only system. It’s a small, rugged and lightweight unit that can be utilized in a variety of inspection environments. All configurations of the MIZ-85iD are completely sealed to provide protection from environmental and radiological contamination. This protection ensures the unit’s integrity in electronic performance and allows the unit to be serviced throughout the life of the product. Just like the MIZ-80, the MIZ-85 conducts highly efficient and cost effective eddy current inspections of steam generator and condenser tubing in nuclear and conventional power plants. 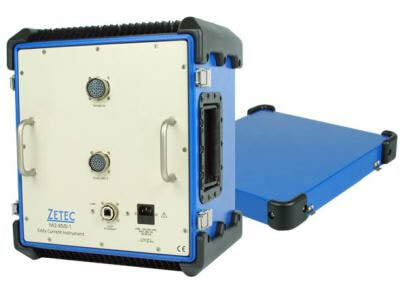 Advanced capabilities of the MIZ-85iD, such as the on-board electronic differential reference probes, and an internal electronic connector pin multiplexer, eliminate the need for common adapter cables. These features also provide you with superior data quality and promote better analysis results. ​The Auxiliary A/O Control Lines provide integration with probe delivery systems and probe position encoders.